‘Whiteout’ by Sonia King, one of today’s leading mosaicists. Sonia King in the studio of her San Francisco modern home. She studied painting, and she painted. She learned sculpture, and she sculpted. She even learned business, getting an MBA on top of her BFA, and went to work in art marketing. But it took Sonia King a while to find her true métier. Marketing wasn’t quite it. “At some point I just said, ‘I must make art now,’” King says. Then, in the early 1990s, she took a look at her mother’s old mosaic tools. 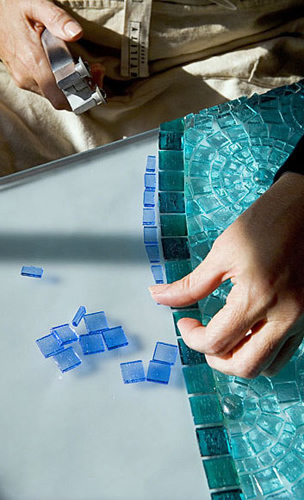 She picked them up, the nippers and cutters, and began working on her mother’s old tesserae, bits of glass and ceramic. She’d found what she was looking for—an art form that takes an almost childlike delight in creating an overall composition made up of disparate shards and slices that remain as important to the work as the image itself. 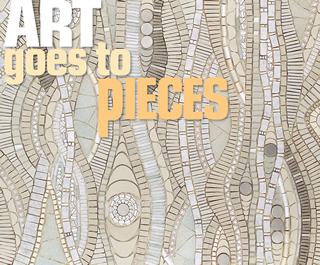 Today, Sonia King is one of the leading artists in the current mosaics revival. 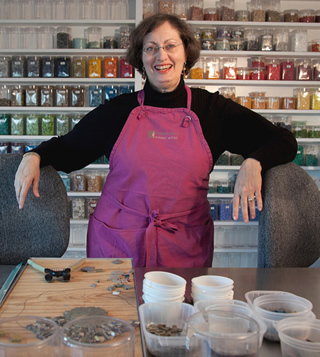 Using a variety of materials, including stained glass, vitreous glass, abalone, handmade glass, beads, and more, she focuses on hanging art pieces but does installations as well. Much of the current revival is rooted, as is King’s own work, in an earlier revival in the 1940s and 1950s, when Sonia’s mother, Sherri King, a Texan who had commissioned a modern home and had hobnobbed in Mexico with painter Diego Rivera, soon found herself seriously involved with the art. 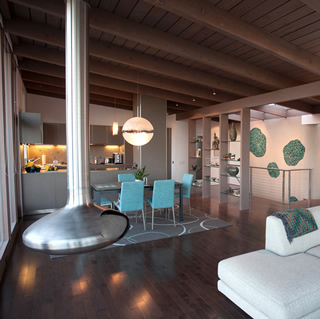 King’s living and dining rooms, with three pieces from her ‘Nebula Aqua’ mosaic series on the back wall. By the time World War II had ended, the word was out. Modern technology and materials, modern organizational techniques and—yes—modern design had helped defeat the Axis powers. And now, everyone knew, modernism would give a new and better life to Americans on the home front. A big part of the mix would be ‘new’ materials, including pre-stressed concrete, concrete block, aluminum, and plastics. But just as new materials and techniques were coming to the fore, so were a material and a technique rooted in the days of Philip of Macedon. He wasn’t the only one who thought so. In the late 1940s and early 1950s, as the enamel tesserae from Italy used in many mosaics became available again, modern mosaic murals of abstract design or simplified, abstracted representation were popping up on schools, public and commercial buildings—and on homes. In Los Angeles in 1955, artist Joseph L. Young used mosaics to tell the city’s history on the walls of police headquarters, the first of many such murals he’d do in the area. In San Francisco, Anshen and Allen, Eichler’s architects, brought in artist Jean Varda and mosaicist Alfonso Pardiñas to enliven their Villa Roma Motor Hotel near Fisherman’s Wharf with mosaics—as though the donut-shaped building wasn’t lively enough already.